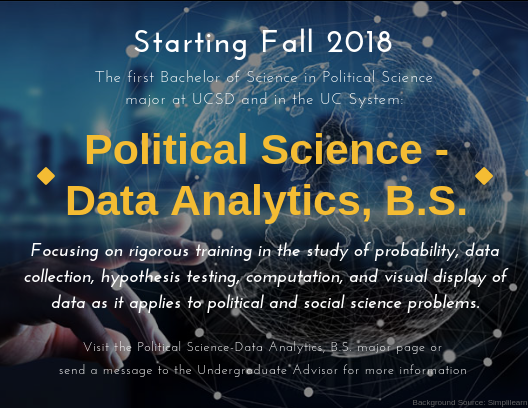 Rigorous training in the study of probability, data collection, hypothesis testing, computation, and visual display of data as it applies to political and social science problems. Five upper-division Data Analytics courses chosen from the following: POLI 100F, 118, 137, 168, 170A, 171, 172, 173, or 179. Please contact the Undergraduate Advisor, Natalie Ikker, via the Virtual Advising Center or drop-in advising to discuss the major, course requirements, and how your major plan or transition will look like.